Earth Aware Editions, 9781608874088, 240pp. The National Parks: An American Legacy tells the story of the parks through the photography of Ian Shive and poignant essays by today's leading naturalists, scientists, explorers, and artists. From the cascading waterfalls of Yosemite to the unique geothermal features of Yellowstone, the U.S. national parks are among the most breathtaking destinations in the world. Founded to preserve such natural beauty for posterity, the national parks represent one of America's crowning achievements and international treasures. 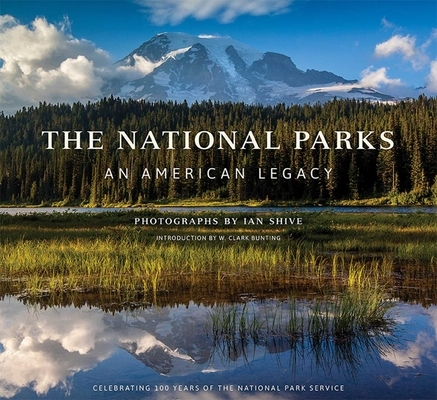 The National Parks: An American Legacy tells the story of the parks through the photography of Ian Shive, today's leading national park photographer, as well as through poignant essays by conservancy groups from across the country. Timed to coincide with the celebration of the 100-year anniversary of the National Park Service, this lavish volume reveals the grandeur and history of the parks and looks toward what the next 100 years will bring. With more than 200 never-before-seen images of the national parks -- including Yellowstone, Yosemite, and the Grand Canyon -- as well as images from many of the 400-plus national park units, this striking collection is comprehensive and inspiring. The National Parks: An American Legacy reveals the way humankind interacts with the parks, and how the story of the national parks is also a tribute to the people who visit, explore, and tirelessly work to preserve these cherished American landscapes. Ian Shive is an award-winning conservation photographer, author, educator, film producer, and environmental advocate, as well as the recipient of the Sierra Club's Ansel Adams Award for Conservation Photography. Shive's images have appeared in publications around the world, including National Geographic, Men's Journal, Outside, Backpacker, National Parks, Nature Conservancy, Smithsonian, and hundreds of others. Often referred to as the leading chronicler of America's national parks and endangered ecosystems around the world, Shive is most proud of his role in helping bring science and conservation stories to life with his photography and films. W. Clark Bunting serves as President and CEO of National Parks Conservation Association (NPCA), a nearly 100 year-old non-profit advocacy organization, following a distinguished career as a businessman and innovator within the media industry. At NPCA, Bunting is combining his passion for conservation with his political and business skills to lead the non-profit as well as the national parks movement into their second century.